Here is yet another scone recipe. I really don’t think I will ever get my fill of making scones; they are really one of my favorite things to bake. I don’t really know what it is about them; maybe it is the fact that there are so many ways to make scones or the fact that I love breakfast foods. For me I would take a scone over a muffin any day, don’t get me wrong I like muffins too, but I like the texture of a scone better. 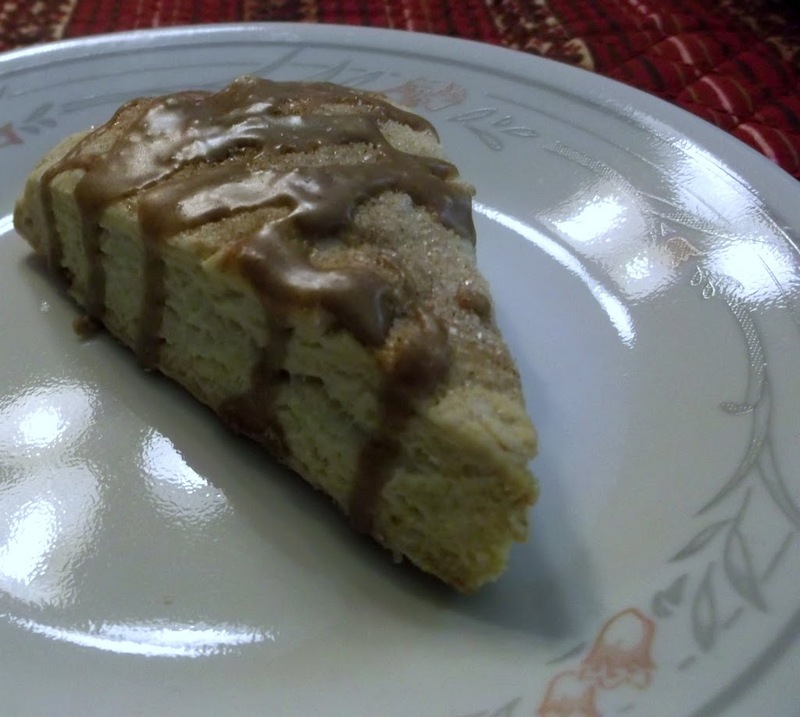 I have had my eye on making cinnamon scones for sometime now. I actually have made them a few times, but I was bound and determined to make my own recipe. Well each time that I made them I found something wrong with them. My family always enjoyed them, but to me they weren’t what I thought they should be. So I finely caved in and found a recipe on the internet that sounded yummy and made that. The scones were good, but a little on the dry side. 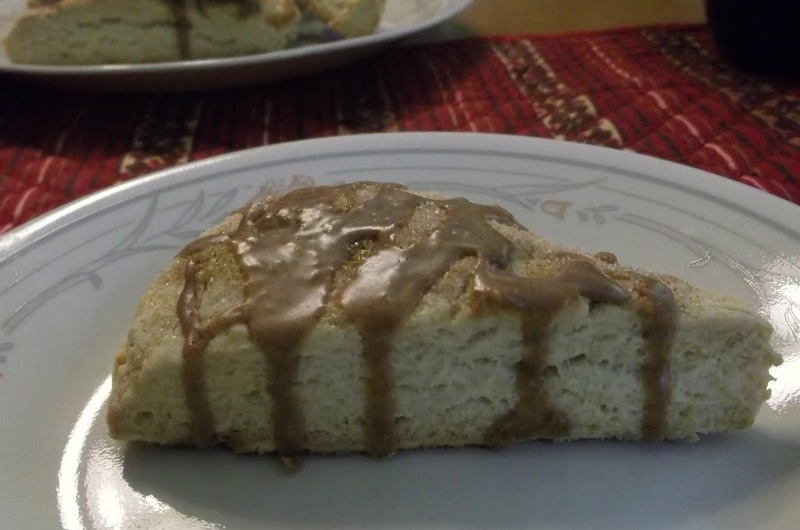 The only cinnamon is sprinkled on the top of the scone along with some sugar. So to give the scones a little more cinnamon flavor I made a cinnamon glaze and drizzled that over top of the scones. The glaze gave the scones the touch that they needed. I actually sent the majority of these scones along with our daughter Krista when she went back to Chicago. So I am hoping that she is enjoying them and if you make these scones I think you will enjoy them too. Preheated the oven to 400 degrees. In a large bowl, stir together flour, baking powder, baking soda, and salt. Cut in butter until the mixture is the consistency of coarse crumbs. Using floured hands, lightly shape dough into a flattened ball. Roll or pat out on a floured surface to a circle about 1/2 inch thick and 8 1/2 inches in diameter. Using a floured pizza cutter or knife, cut 8 or 12 equal wedges. Place them slightly apart on a greased or non-stick baking sheet. In a small bowl, beat egg white slightly to a froth. In another bowl, blend 1 tablespoon sugar and cinnamon. Brush scones lightly with egg white, then sprinkle them with the cinnamon and sugar. Bake for 10 to 12 minutes or until golden brown. Once they are cooled drizzle with glaze and enjoy. They look delicious! I love that you used buttermilk in them. These look awesome! 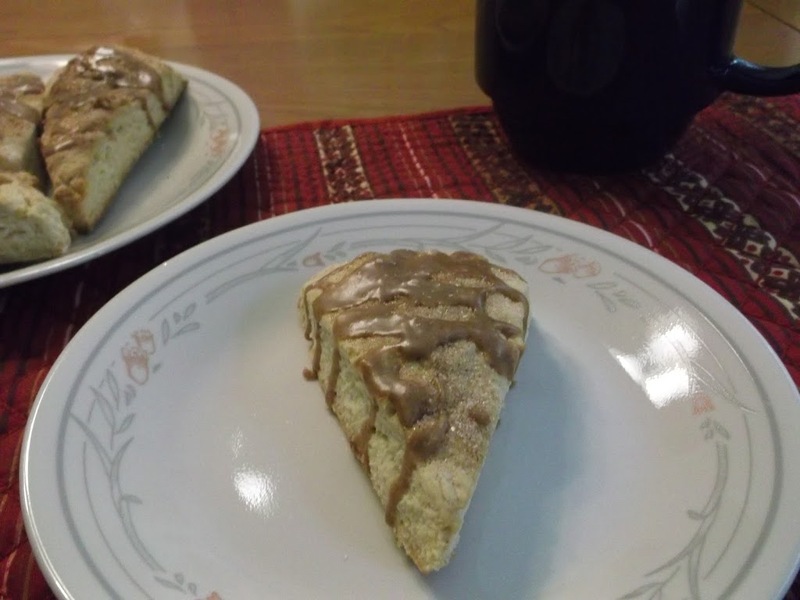 I have also tried recreating starbucks’ scones. I would love to try these as well!